I was born during the Second World War in the Orkney Islands where my father was stationed in the Air Force and was soon evacuated with my twin sister to North Wales to be brought up by my grandmother for its duration. Afterwards we rejoined my mother in London to start school. She was a professional artist and a scratch golfer and encouraged us in both pursuits. I was more interested in the piano and got as far as passing Grade V11 of the Royal Schools of Music in the UK before deciding it was not going to be the right thing for me. My mother sadly died at the young age of forty not long after she had remarried and was at the peak of her painting prowess. I travelled to the States the Middle East and in Europe before deciding to spend four years at the Heatherley School of Art then in Pimlico which had an excellent atelier system of teaching like the 20th century Paris schools. We were encouraged to find our own subjects in still-life and landscape but were taught the classical way of painting and portraiture. I combined this with part-time secretarial work as the computer had not then come in and secretaries were still a necessity in London. 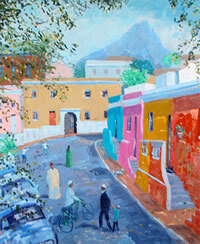 I married and had two children and am now living in Cape Town with my second husband a South African with Derbyshire roots who also loves painting and framing. I find the light here much brighter than in the United Kingdom and it is a bonus to have so many clear days both for outside painting and in order to be able to analyze colour more easily. 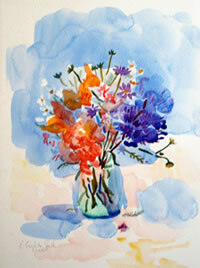 I think of myself as a 2lst Century impressionist as I still prefer that style of painting to any other. I paint in both oils and watercolour.